Hi DC Bike Ride Family! 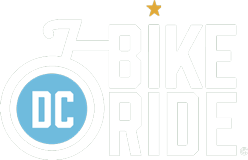 We’ve got a special announcement for you: Early Bird Registration for the third annual DC Bike Ride opens on Thursday, February 1! Early Bird Registration is $50 for a standard adult, and includes a 20-mile car-free route, a snazzy DC Bike Ride water bottle, your Rider Identification Kit, an invite to the Packet Pickup Party (say that five times fast), sponsor giveaways, on-course entertainment, and a fun celebration at the Finish Festival with live entertainment and activities. For families, you can register your kids ages 8 to 17 for half-price, and youth ride-a-longs ages 3 to 7 are always free. Don’t miss this chance to get in early at the discounted price and experience DC’s only closed-road, car-free, recreational, community-focused bike ride. We’ll see you there!